To save ancient Arabic texts from Al Qaeda, a band of librarians pulls off a brazen heist worthy of Ocean's Eleven in this "fast-paced narrative that is...part intellectual history, part geopolitical tract, and part out-and-out thriller" (The Washington Post). In the 1980s, a young adventurer and collector for a government library, Abdel Kader Haidara, journeyed across the Sahara Desert and along the Niger River, tracking down and salvaging tens of thousands of ancient Islamic and secular manuscripts that were crumbling in the trunks of desert shepherds. His goal: to preserve this crucial part of the world's patrimony in a gorgeous library. But then Al Qaeda showed up at the door. 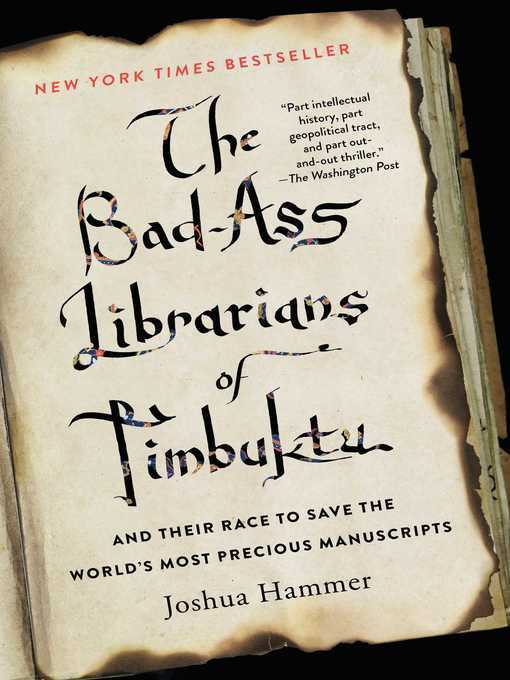 "Part history, part scholarly adventure story, and part journalist survey....Joshua Hammer writes with verve and expertise" (The New York Times Book Review) about how Haidara, a mild-mannered archivist from the legendary city of Timbuktu, became one of the world's greatest smugglers by saving the texts from sure destruction. With bravery and patience, Haidara organized a dangerous operation to sneak all 350,000 volumes out of the city to the safety of southern Mali. His heroic heist "has all the elements of a classic adventure novel" (The Seattle Times), and is a reminder that ordinary citizens often do the most to protect the beauty of their culture. His the story is one of a man who, through extreme circumstances, discovered his higher calling and was changed forever by it.